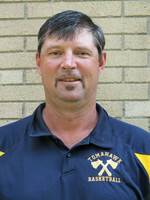 A graduate member of the Tomahawk High School Class of 1981, active in basketball, track and baseball. Jim “Beanpole” as he was called earned eight letters during his high school career, receiving three letters in basketball and track and two letters in baseball. In addition to these honors, Jim was a two time First Team All Conference athlete, two time Channel 7 All Star, as well as earning all state honors in basketball. He led his team in scoring both his junior and senior years. As good as he was in basketball; it was in track where he left an impressive mark. As a junior, he was Second Team All Conference in the high jump, regional champion, sectional third place and state participate. He improved immensely his senior year in track as he was a conference champion in both the high jump and long jump and he concluded his track career with a third place finish in the high jump. His effort of 6’ 7” was a new school record at Tomahawk. Jim received basketball scholarships to attended Northland College, Gogebic Community College, and the UM-Duluth from 1981 to 1988. While at Northland College, he was voted Most Valuable freshman, earned First Team All Conference honors and also earned All District 14 honors. At UM-Duluth, he was Second Team All Conference in 1986-87, and First Team All Conference, All District 13 honors, and All American Third Team NAIA during the 1987-88 season. Jim has donated countless hours coaching Tomahawk athletics, and coaching Basketball Backers for both girls and boys 5th through 8th grade teams. Jim currently works for Louisiana Pacific in Tomahawk holding several positions most recently Press Operator.